Come and meet Ross Welford, author of three highly acclaimed and award-winning novels. All set in the North of England, Ross’s books feature time-travel, immortality and invisibility. Ross will be talking about his characters, inspiration and how he became an author, there’ll also be opportunities to get involved and hopefully even be time for a touch of magic! Ross Welford worked as a business journalist before becoming a freelance writer and television producer, working on shows such as The Big Breakfast, This Morning and Bridezillas. Ross’ debut novel, Time Travelling with a Hamster was shortlisted for nearly every major literary award including the Waterstones Children’s Book Prize, The Costa Book Award and The Blue Peter Book Award. 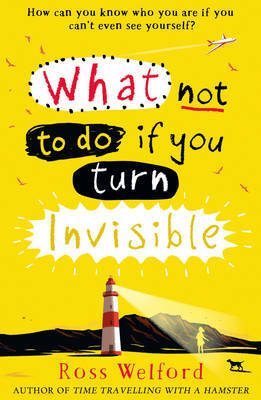 His second novel for young readers What Not to do If You Turn Invisible was published earlier this year. Ross’ debut novel, Time Travelling with a Hamster was shortlisted for nearly every major literary award including the Waterstones Children’s Book Prize, The Costa Book Award and The Blue Peter Book Award.